The Canon EOS 80D is Canon’s Best mid-range APS-C SLR. Upgraded from the 70D to a full 24.2 megapixels. It shares many of the features from the Canon 5D Mark III, but at a lower cost and weight. This is the first Canon DSLR to introduce the new Dual Pixel CMOS AF technology that greatly enhances autofocus capabilities, especially when filming video. The 80D HD movie mode shoots at Full 1080p HD Video at popular frame rates 1080p @60fps, 30fps, 24fps and 720p @60fps and with manual exposure control. The 80D includes an HDMI port to hookup to an HDTV and an External Microphone Jack for better sound options with manual audio control. A headphone jack has also been added. The 80D gets a new high resolution articulating 3-inch LCD touchscreen (1,040,000 pixels). New Digic 6 Image Processor. Fast 7.0 fps continuous shooting, Use the large LCD touchscreen with the Live View Function for composition of both pictures and video. EOS Dust Removal System removes dust from the sensor automatically. Gapless micro-lenses in the sensor helps to capture more light and reduce noise. Canon 80D Features: The EOS 80D’s Intelligent Viewfinder has 100% field of view and a wide viewing angle with all glass prism. Greatly improved low light performance, including ISO 16000. 63-zone evaluative metering system. A display off sensor, turns off the LCD when you are looking through the viewfinder. Upgraded to 45 AF Focus points. Compatibility with over 103 Canon EF Lenses. Upgraded to the new DIGIC 6 Image Processor, which provides fast, accurate image processing, AF, and faster startup time. The ALL-I codec records at: 90 mb/sec bitrate for best video quality. HDMI out to HDTV. Built-in WiFi & NFC. Canon 70D to 80D Upgrade Features: The 80D is greatly upgraded from the 70D. Upgrades include, a new 24.2 (from 20.2) megapixel imager with dual pixel AF technology. Higher dynamic Range. AF points have increased from 19 to 45 and AF working range has been extended down to EV -3. Full HD video now upgraded to shoot 60fps 1080p. Added a headphone jack to monitor your audio. Digic 6 Processor upgraded from the Digic 5+ processor. Native ISO has increased from 12800 to 16000. Shutter speeds: 30 – 1/8000 second, ISO: from 100-16000, Burst Mode: 7.0 fps, Built-in Flash. Memory Cards: SD/SDHC/SDXC. Lithium-ion battery LP-E6 (included). USB 2.0. Kit Lens Options: 18-135mm or 18-55mm f/3.5-5.6 STM Lens. Video: approximately 44 to 128 minutes of 1080p video can fit on a 32gb SDHC memory card (using ALL-I or IPB compression). Dimensions: 5.5″ x 4.1″ x 3.1″ ( 1.61 lbs. w/ battery). Smart-Review Commentary: Canon’s 80D is a midrange entry with most of the power of the Canon 5D Mark III, with a better focusing system, but at a much lower cost, size and weight. It has the same Digic 6 processor for faster processing. The big news for this camera is the new 24.2 megapixel imaging sensor with Dual Pixel AF technology. This is an upgrade camera to the fantastic 70D. This allows for much faster and acccurate AutoFocus, especially with video capture. This is the best DSLR autofocus system available and the one of only a few cameras currently with this technology. The touchscreen allows you to point at subjects to focus on, and does a decent job at focus pull (in video mode) when you point to another subject to focus on. This is great for fast action and interviews where you can’t manually focus fast enough to follow the action. HD movie capture has Full 1080p HD quality at up to 60 frames/second (blu-ray quality). For better video quality, Canon has the ALL-I codec, which compresses frame by frame instead of intraframe for best quality at up to 90mbps. In addition to an external microphone jack the 80D now has built-in stereo microphones. Built-in WiFi is new and allows you to share photos, and even control your camera with a smartphone. In the SLR mode this camera has a fast 7.0 frames/second burst mode, AF points have increased to 45, and ISO has been upgraded to 16000. The 80D is an awesome camera for both pictures and HD video. It is one of the best DSLRs for filming video (We previously have shot with the 70D with the same focusing technology). 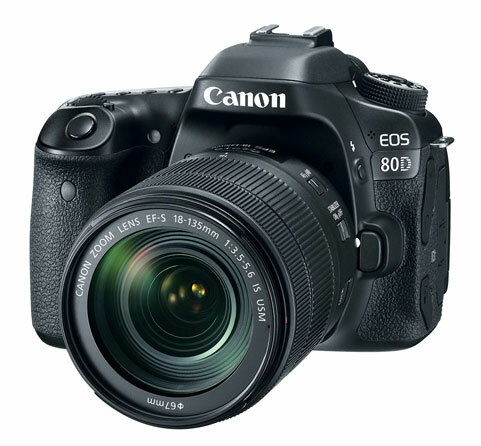 The 80D has received outstanding professional and consumer reviews. This model is not only a SmartReview top pick, but has won our BEST of 2018 award for APS-C DSLRs. Canon EOS 80D Lens Compatibility: The 80D is compatible with over 100 EF and EF-S lenses. The EF-S lenses are specifically designed for APS-C imager SLRs such as the 80D. APS-C SLRs have a focal length conversion factor of 1.6 compared to full frame SLRs. Wide Angle, Zoom, Macro, and Prime Lenses are available.